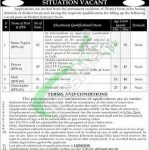 This page is about District and Session Court Swat Jobs 2018 Application Form Download Online. Applications are invited from the permanent residents of District Swat and having the following qualifications and skills for the following vacant positions in District and Session Judge / Zilla Qazi, Swat such as (Stenotypist, Driver, Mali, Chowkidar). It the finest opportunity for the residents of Swat to have a job in Government sector because here they’ll be able to perform their duties under Government rules for which they’ll be offered handsome salary package with other fringe benefits. So, those who are willing to apply for these jobs should hold relevant qualification and experience as per the criteria mentioned below. For Stenotypist Intermediate or Equivalent Qualification from recognized Board is required to apply with 50 words per minute speed in shorthand and 35 words per minute speed in english typing and 30 words per minute urdu typing speed is required to apply. For Driver Middle pass having HTV/LTV driving license are eligible to apply. For Mali literate individuals can apply. For Chowkidar literate candidates can apply. So, viewers in the above we’ll discuss eligibility criteria and those who fulfill it should apply as per the following how to apply procedure given as per the rules of district and session court Swat. Candidates wanted to apply are requested to download the application form from www.dsjswat.gov.pk. Application Form along with attested copies of educational certificate, experience certificate, diplomas, CNIC, Domicile and recent photograph should reach the following address given below. Address: District and Session Court / Zilla Qazi Swat.